When it comes to Marvel's big brutes, there are none more iconic than the Incredible Hulk himself. Bruce Banner's big and green alter ego has been one of Marvel's most popular heroes for decades. While Hulk may be the most popular brute from Marvel, as it turns out he may no longer be the strongest. Avengers: Infinity War is set to finally show us the strengths and magnificence of Thanos, the Mad Titan that Marvel Studios have been setting up since his first appearance in 2012. Marvel fans are not only anxious to see Thanos grace the big screen, but are also excited to see how well he faces off against Hulk. However, according to the Avengers: Infinity War directors Joe and Anthony Russo, things may not turn out in Bruce Banner's favor. "I mean it's like death comes to call for the Avengers," Joe Russo said in an interview with HeyUGuys, describing what to expect from the Mad Titan. "This is a nearly unbeatable force who is determined to destroy half the life in the universe to bring it to balance. He sees it as an overgrown garden that he needs to prune. As you mentioned, he is fairly invincible. He's a sort of genetic mutation who's the Genghis Khan of the universe. He's unbeatable on the battlefield, stronger than the Hulk, skin is invincible. So it's going to cost the Avengers something to defeat him." While this immense power level was previously established in the comics, it is always good to know that he will be just as strong on screen. Clearly, Thanos is not a force to be trifled with. As Thor: Ragnarok seemingly established, Hulk is the "strongest Avenger," so the fact that Thanos is even stronger than him is certainly a bit of a concern for Earth's Mightiest Heroes. Unlike in previous movies, Hulk won't be able to smash this villain on the ground a bunch of times, like he did to Loki. 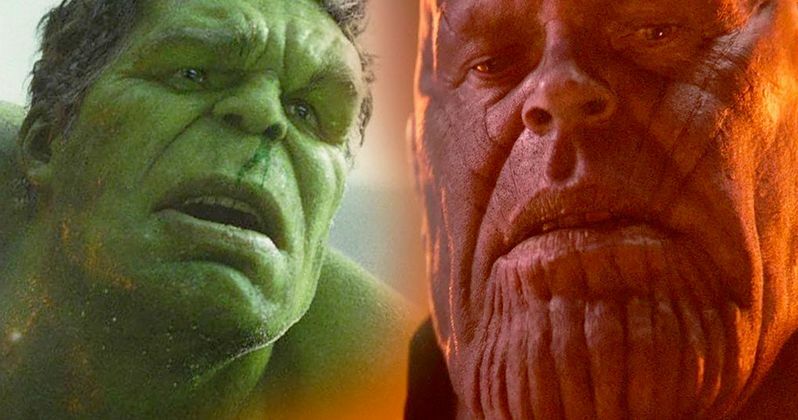 The directors have previously teased that we will see an all out brawl between Thanos and the Hulk, which certainly got fans excited. It is presumed that Bruce Banner will have quite a bit of development in Avengers: Infinity War, which will understandably follow his character arc set up in Thor: Ragnarok. It's been predicted that in Infinity War, Banner will still be terrified to become the Hulk again, afraid of losing control of himself, so when he does become the Hulk, it'll be a big moment for the green giant. However, it's starting to look that it won't be too big of a moment, as Hulk apparently won't be able to put too much of a beat down on the Mad Titan. In his interview with HeyUGuys, Joe Russo described Thanos as "nearly unbeatable", which may not fair well for the Avengers. While the Avengers themselves are certainly strong, it is unlikely that they would be described as "nearly unbeatable," considering the amount of times they have been beaten. The more we learn about exactly what the Avengers are up against, the less and less likely that it seems all of our heroes will make it out alive.